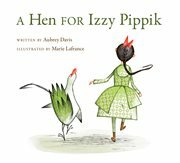 The item A hen for Izzy Pippik, (electronic resource) represents a specific, individual, material embodiment of a distinct intellectual or artistic creation found in Austin Public Library. When Shaina finds a magnificent hen, she knows that Izzy Pippik, the hen's owner, is sure to return for her, but when dozens of eggs hatch and rowdy chickens scatter throughout the village, Shaina must fight the entire town if she has any hope of protecting the birds. Inspired by Jewish and Islamic traditional texts. Ruth and Sylvia Schwartz Children's Book Award for Picture Book, 2013.